Did You Know…? 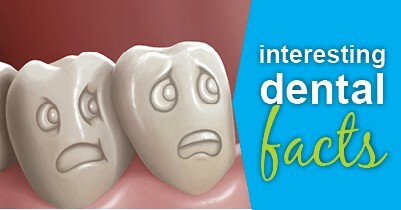 Your Douglasville Dentist Shares Some Fun Dental Facts! At the Douglasville dental office of Dr. Jim Williams, we always like to educate our patients on their oral health, so we talk a lot about periodontal disease, cavities, and the proper at-home care for a healthy mouth. Today we’re going to share some little known fun facts. The average person produces around 25,000 quarts of saliva in a lifetime. How much is that exactly? Well, it’s enough to fill 2 swimming pools! And it’s a good thing that we tend to produce so much. Saliva can help neutralize acid and fight tooth decay. Any guess as to what the hardest substance is in the body? It’s your tooth enamel! But that doesn’t mean you should use your pearly whites to open pesky packaging — doing that can lead to chipped or broken teeth in Douglasville. On average, most people spend only about 48 seconds brushing their teeth everyday. You really should be doing it for much longer. Take our word for it. In fact, the Academy of General Dentistry recommends that you spend at least 2 minutes every time you brush. Say cheese! This common pizza topping is good for your grin since the calcium and phosphorus reduces the pH level in plaque and re-mineralizes tooth enamel. And speaking of pizza: You know when you burn your mouth with hot food? It’s actually called pizza palate! Dr. Jim Williams’ Douglasville dental office is here to help you understand your dental health and to educate you on the best at-home routine for a bright and healthy smile. But we’re also here to make dentistry interesting and fun. If you’re overdue for a checkup, call your Douglasville dentist today! Cavities. Nobody wants them, yet a lot of us get them. And while most of us know that cavities aren’t a good thing, many people can be confused about what really causes cavities. 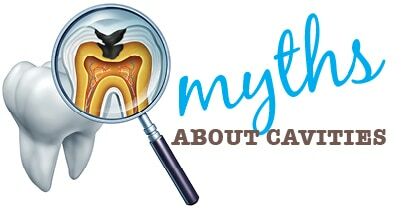 At the Douglasville dental office of Dr. Jim Williams, we’d like to debunk some of the most widely accepted cavity myths so our patients can understand what causes these pockets of decay. Not necessarily. Tooth sensitivity doesn’t always mean that you have a cavity. It could be that you just have sensitive teeth or perhaps a gum has receded and exposed the root. Whatever the reason, if you’re experiencing sensitive tooth pain, it’s important that you visit your Douglasville dentist as soon as possible so we can work together to correct the sensitivity. If you’re due for an exam, call our Douglasville dental office to schedule an appointment today. We’ll perform an in depth exam, work together to fix any issues we may find, and make sure to get your smile in its best shape.